The release of FBI documents relating to the Clinton email investigation reveal that top Clinton aide Huma Abedin picked one username that Clinton would use on the server, despite claiming she had no knowledge of the server. In recent heavily redacted FBI documents relating to the email hacks and the role that one Clinton “confidential assistant” played in the management of Clinton’s mobile devices and email security, certain documents outline a conversation between Clinton aides Huma Abedin and Monica Handley, Clinton Foundation official Justin Cooper. Hanley then said that the new email account name, hrod17@clintonemail.com, was specifically chosen by Clinton aide Huma Abedin. Abedin claimed that she had no knowledge of the private server when the FBI interviewed her on April 5th — before Hanley’s interview. The FBI documents do not show that any agents conducted a second interview with Abedin after Hanley provided this information. The FBI’s notes on Abedin’s interview acknowledge the change of email addresses — after Abedin denies knowledge of the private server — but she did not discuss why Clinton’s email changed or who selected the new address. The notes on Abedin’s interview do not discuss the hacking of Sidney Blumenthal’s email or the subsequent conference call involving Abedin. ABEDIN did not know that CLINTON had a private server until about a year and a half ago when it became public knowledge and did not recall any discussion about it during the transition. Shortly after CLINTON became the Secretary of State COOPER established the @clintonemail.com domain and CLINTON began using hdr22@clintonemail.com as her primary email. The only other person at DoS to receive an email account on the domain was ABEDIN. Later in CLINTON’s tenure she changed her email address to hrod17@clintonemail.com. 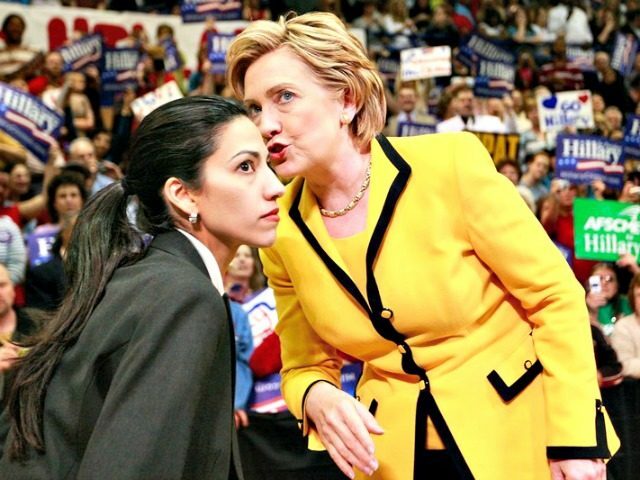 ABEDIN was not familiar with the email address hr15@mycingular.blackberry.net or with [redacted]@gmail.com. According to the documents, one of Hanley’s tasks was finding replacements for Clinton’s Blackberries — thirteen of which were reportedly destroyed, some with hammers, during Clinton’s time in the State Department. FBI documents show that Hanley noted a “coffee incident” in relation to one of Clinton’s Blackberries.